The blood: the Life that flows through us, taken in as breath, fresh each second, flowing out to be renewed in the world of nature; natural, given. There is no more beautiful a coastline in which to explore the mystery of our being than Northumberland. The beaches are wonderful, the climate is usually mild late into the Autumn. The mellowness of September will be perfect. This former Kingdom in its own right is rich in history; ancient and modern. Yet, it remains unvisited by most. Look on a map and you’ll see how it’s lovely hills and coast form a separate realm between England and Scotland. The castle or the fortified tower is capable of being used as working symbol of the way we guard against life; and Northumberland is full of such treasures. They mirror its history, from the ancient political and religious roots to its lawless centuries when gangs – land pirates – roamed, unchecked, in the times of the Border reivers. 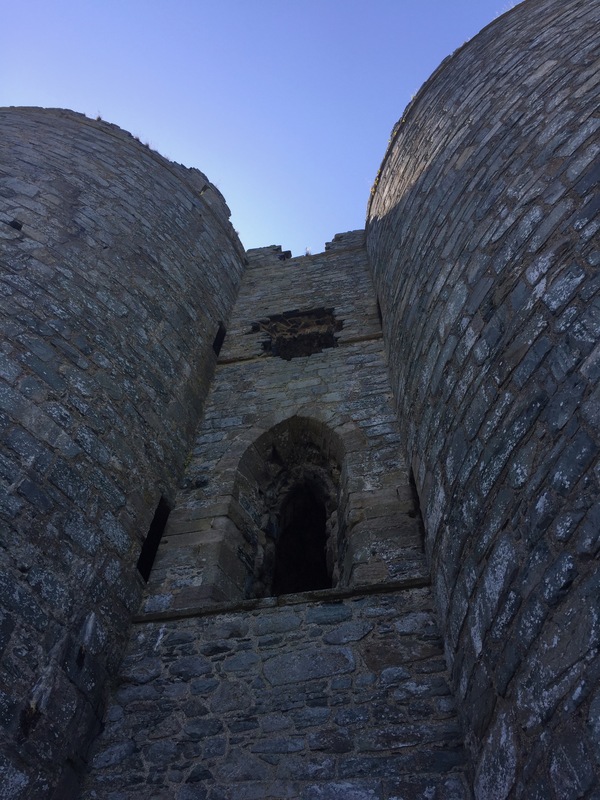 (Image above: the fortified Tower – about which, more later…. Pilgrims have always come this way, drawn by the Holy Island of Lindisfarne. We, too, will be drawn towards its mysterious and ancient shores, the birthplace of English (Celtic) Christianity. But, before we make that last odyssey across the causeway (or sands, for the adventurous) to that final island of the soul, we will make other journeys along the edge of the land, journeys that use coast and castle to explore the seemingly contrasting nature of survival and spirituality. To begin our journey as pilgrims of blood and stone, we will gather, in the late afternoon, of Friday 14th September, in the lovely village of Bamburgh – home to the world famous castle of the same name. The Victoria Hotel will host us for tea, coffee and cakes while we make introductions, meet old and new friends, and discuss the plans for the weekend ahead. After this, we will do what pilgrims have always done; we will walk, in essence, beginning the symbolic part of our journey to the Holy Island of Lindisfarne. One of the finest beaches in Britain is a few minutes away from Bamburgh village, and we will continue to set the scene by strolling and considering the splendour of Bamburgh Castle, seen from the shore. 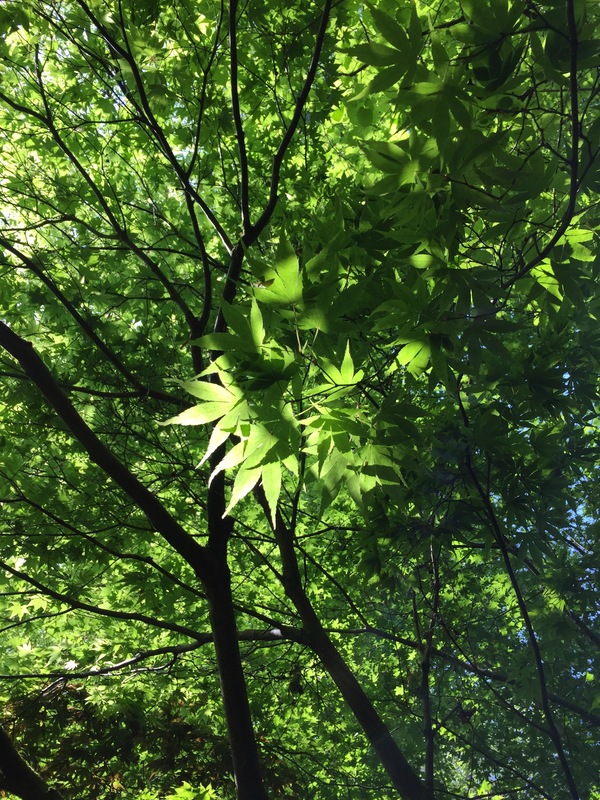 During the walk, we will share thoughts and readings on the themes generated by the idea of Castles of the Mind – our name for this Walk and Talk workshop. We will ask the first of several questions, questions designed to shape the weekend from an emotional and spiritual perspective. All our answers will be unique; there is no right or wrong, they simply reflect our experiences and our aspirations. Day Two: Saturday 15th September, 2018 To begin the Saturday, we will drive the short distance to Bamburgh Castle and tour this famous landmark, known as the King of Castles. Bamburgh is the royal seat of the kings of Northumbria and is still a family home–though no longer to kings… The admission price is £11.00 per person and, as with the entry fee for other locations, is not included in the Silent Eye’s booking fee. We will then drive a few miles south, along the coast, to arrive at the beautiful fishing village of Craster. Craster is very compact, and easily explored. A short walk up the hill is the Jolly Fisherman pub, famous for its seafood dinners and ‘light’ lunches. This will be followed by a relaxed walk along the dramatic cliffs of the coastline between Craster and Embelton. A twenty minute walk will take us to the haunting ruin of Dunstanburgh Castle, which stands on a remote headland. Dunstanburgh became a key stronghold during the early fourteenth century; a tumultuous period in English history. Relations between King Edward II and Earl Thomas of Lancaster had broken down. Earl Thomas had begun the construction of the castle in 1313, very possibly as a provocative symbol of his opposition to the King. The Earl mounted a rebellion, but, when it was defeated by King Edward’s forces, he was arrested before he could reach the safety of his intended fortress. Earl Thomas was executed in 1322. Dunstanburgh Castle passed, eventually, to John of Gaunt, who used it to defend against the Scots, converting the twin-towered gatehouse into a keep. During the Wars of the Roses, it was the scene of two sieges and eventually fell into Yorkist hands. Today, it survives as an impressive ruin, but visitors speak of how its ‘presence’ lingers in the memory…. Dunstanburgh Castle is operated by English Heritage, with reciprocal honouring of National Trust memberships. Admission is £5.40. Concessions are available. At Dunstanburgh, we will consider our third question, then, we will drive a few miles east, to visit one of Northumberland’s least-known historical gems: the Preston Pele Tower at Ellingham. Northumberland, has a bloody history; largely because of its position as one of two border counties between England and Scotland. Few places convey the vivid fear and caution of the past as well as the Preston Pele Tower. The tower is owned by Major Tom Baker Cresswell and is privately managed. It was constructed in the 1390s when warfare between Scotland and England was at its height. At the time of the battle of Agincourt, there were 78 such pele towers in Northumberland. Among its owners was Sir Guiscard Harbottle, who was killed at the battle of Flodden in 1513 – the conflict that brought Mary, Queen of Scots to the Scottish throne. By the 16th century, the rest of England was enjoying peace and prosperity. But, in the Borders of Northumberland, raiders, known as ‘reivers’, crossed freely though the area, ravaging and looting. This led to the continued use of ‘tower dwellings’ among the well-off families. The idea may sound attractive – and we could say reflects today’s ‘gated communities’, but the intact interior of the Preston Pele Tower, with its reconstructed rooms, shows how primitive such living had to be. The Preston Pele Tower (and gardens) is privately owned, and admission is a very reasonable £2.00. The extreme nature of this isolation illustrates the power of fear to drastically change lives. With this in mind, we will carry out a mystical and psychological exercise related to our coming arrival in Lindisfarne on Sunday. There are no refreshments at the Preston Pele Tower, but an early dinner will be booked at the nearby Pack Horse Inn in Ellingham. Our final day is a physical and spiritual homecoming. Our pilgrimage is to end on the Holy Island of Lindisfarne, which can be reached (subject to the tides) by car, over the causeway. Lindisfarne can also be reached on foot, across a three mile stretch of marked path over the sands. We will consult on the day, and if there are those who wish to make the final journey a true walking pilgrimage, then we will arrange for one or more cars to be left at Lindisfarne so that the walking is one-way only. Be prepared to be very sandy/muddy if you wish to walk! Having said that, to arrive at a place of pilgrimage after a degree of ‘hardship’ is an entirely appropriate thing. Lindisfarne needs little introduction. The monastery there was founded by an Irish monk, St Aidan. Aidan had presided over the monastery at Iona, off the west coast of Scotland. He was sent to establish the Lindisfarne community in the year 634 AD, and remained there till his death in 651 AD. a large car park; the first major feature you come to, having crossed the tidal causeway. Two main streets, one of which leads to the crossroads and, beyond, the excellent museum; the other involves a fifteen minute walk to the far end of the island where the castle is situated. There is also a meditation garden, which we may use if time permits. For ease of finding, we will meet at the Oasis Cafe, which lies on the road from the car park. The castle is currently undergoing work, but the visitor centre within it is open. The walk down from the village is well worth the views of the beaches and the headland on which the castle is built. If we have worked our collective intentions well, we should each feel a certain ‘presence’ when we arrive on the island of Lindisfarne. To conclude our weekend, we will remember the bravery of the early fathers of religion, such as St Aidan, who set sail into the complete unknown to establish their faith on distant shores. We can, perhaps, have little understanding of the depth of that faith; but we can, in our own ways, recreate that ‘setting off’ into the unknown – without fear. Weekend of 14-16 September 2018. We’d love to have you with us. You can find our more about the Silent Eye School of Consciousness here. 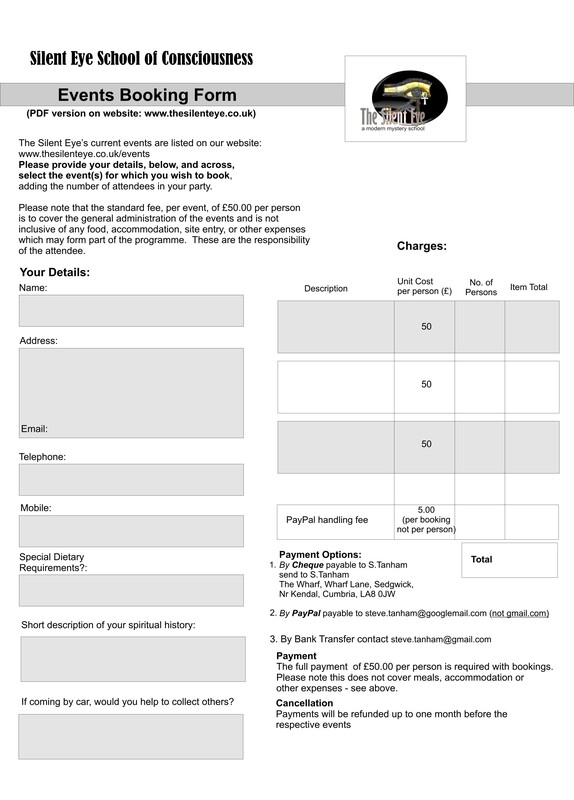 There is a charge of £50.00 per person. All other expenses, such as accommodation, food and entry charge for the sites visited, are the responsibility of those attending. Meals are usually taken together in a local pub, and the costs shared. Is love of ochre gained from you? The first (Plan A) says you should put up with the weight and pack a good set of waterproofs. Then, as soon as the heavens open, stop cycling and put them on. The second (Plan B) says that, as long as the underlying temperature is warm-ish, there’s only so wet you can get, and you’ll soon dry, so why bother…? The lone cow on the rocky outcrop as we were pedalling away from Hynish should have warned us. Still feeling euphoric from the previous two hours, I had dismissed the ‘You’ll be sorrrry’ cartoon that sprang to mind, Warner Brothers style, from my subconscious. Failing that, the vertical orientation of the seagull’s body in the photo above should have shouted a hint, but no… what looks obvious in hindsight, in the photos, was less so on the day. So we pedalled on, and now, looking at the shots, I can see the blue sky ahead that we embraced and the darkening silver behind, that we ignored. The deluge wasn’t instant; those dark clouds took a while to arrive, while we cycled into the seeming blue. At least wary of the weather, we had a further destination in mind: Soroby. This hamlet is the site of a graveyard of considerable interest because it links the pilgrim island of Iona with Tiree. 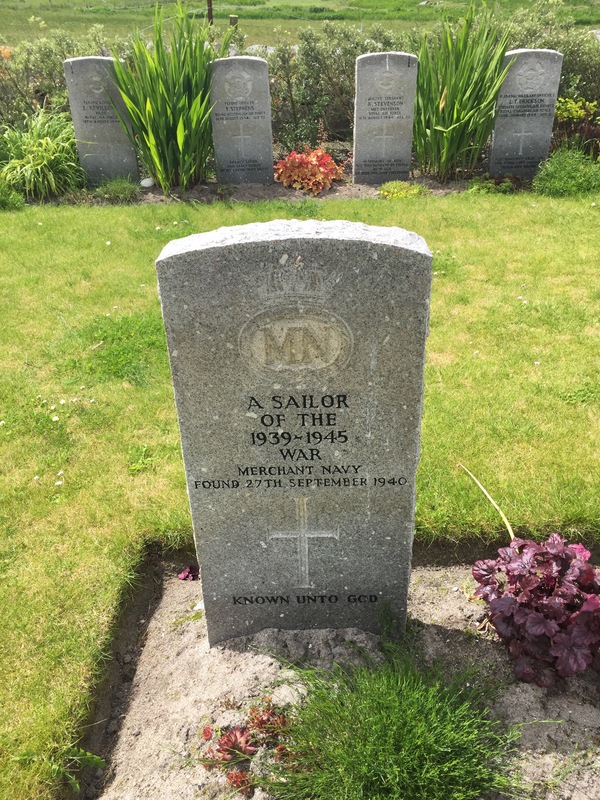 Much of the graveyard is relatively modern, and many of the (well-tended) graves mark the tragic loss of life of a merchant ship in World War II. Many of the bodies were washed up on the beaches of Tiree and their identities never discovered. The beautiful epithet ‘Known to God’ marks their anonymous sacrifice. 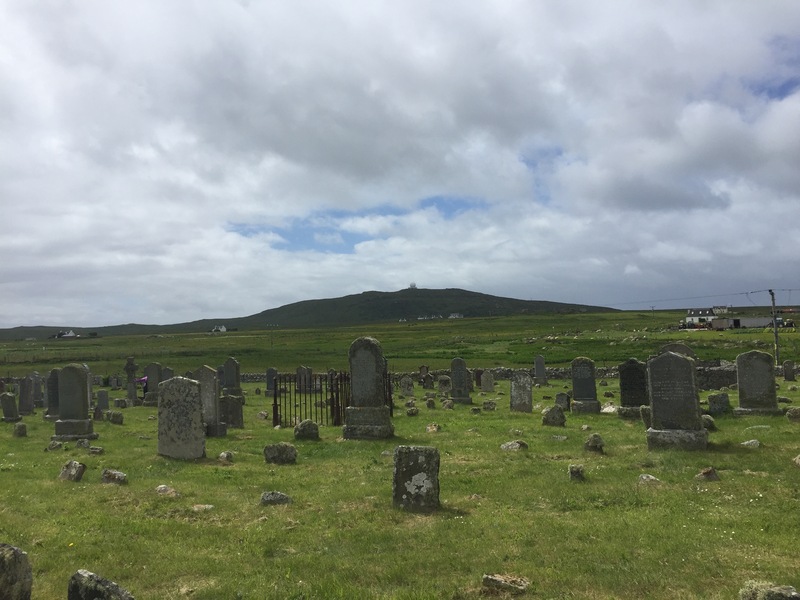 But, a smaller and older part of the graveyard is believed to be the site of a monastery established by St Columba as an extension of the work of his first church on Iona, following his self-imposed exile from Ireland, where it is said he led a rebellion and started a war which resulted in ten thousand deaths. This was prior to his conversion to Christianity, which he then vowed to spread across the seas to Scotland. This man, loved and feared in equal measure it is said, also established a monastery on Tiree for ‘wayward monks’. If you’ll forgive the humour, it appears to have been a kind of early ‘Craggy Island’ as in the Father Ted series… This was known as Baithene’s Monastery, and was founded in 565 AD. The ruins of that original monastery have never been found, though it is known that a church stood here from the 13th to the 19th centuries. 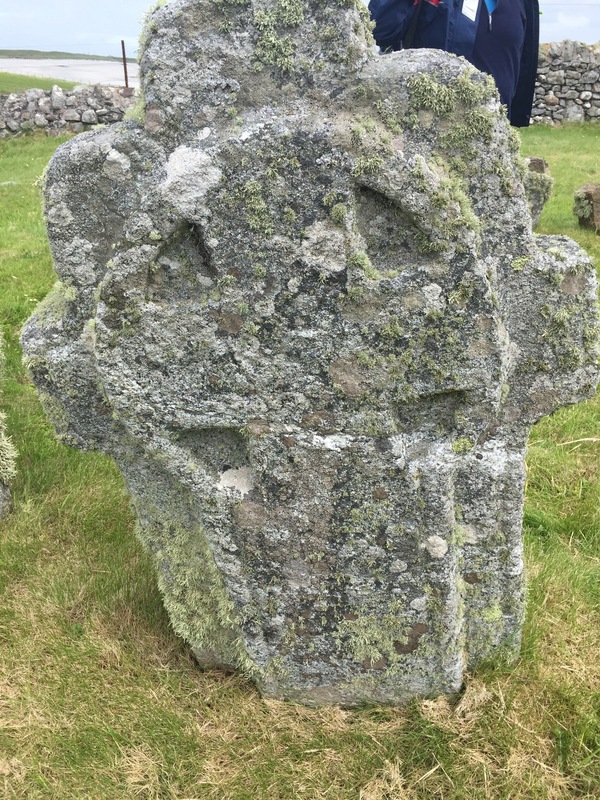 However, one very important artefact remains: a double-faced stone cross from that early period of religious life on Tiree. 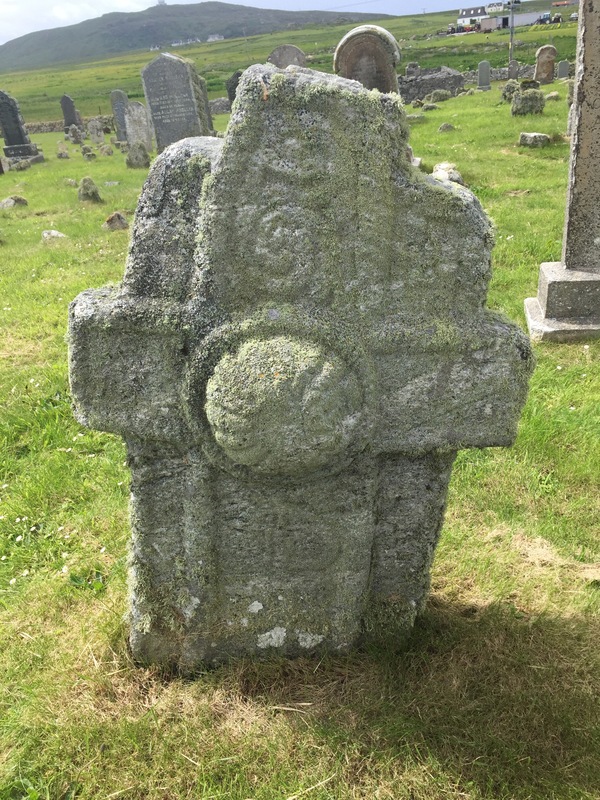 It is known, now, as McLean’s cross, after the clan which ruled Tiree from 1390 to 1680, it is linked to the life of Anna McLean, who was the prioress of Iona from 1509 – 1543. The cross has two sides: the first, with its raised boss at the centre of a ‘cross and spiral’ design, is Celtic. The reverse is in the form of a Latin Cross. It suggest an ancient piece, created when Christianity was well established, yet still in touch with its Celtic roots in these parts. One of the locals suggested it was 8th century, but we had no way of verifying this, and I can find no other reference to it. 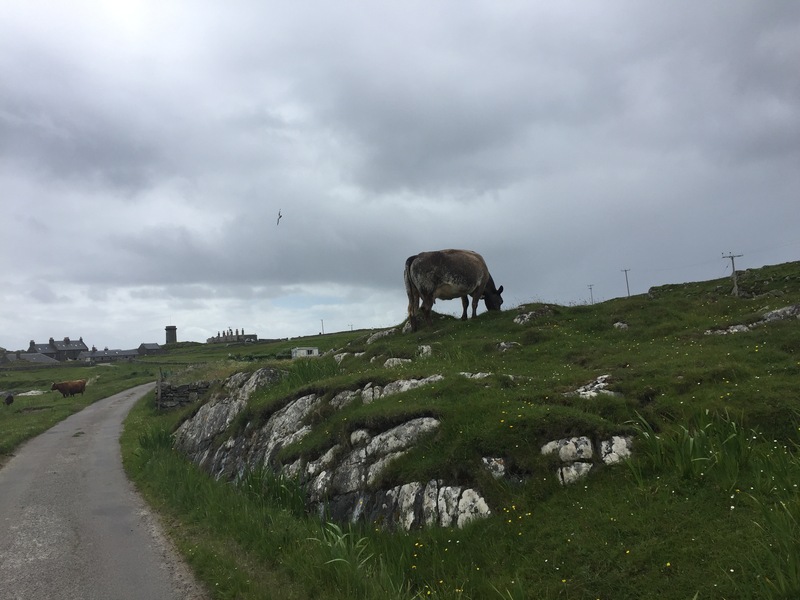 Quietly, and deep in thought, we left Soroby, intending to double-back on ourselves a short distance and take the direct road over the spine of the island and to Tiree’s north coast. We had cycled away from the wonderful village of Hynish knowing that the best part of the day was likely over. The sheer mental adventure of discovering the story of the Shore Station and the Skerryvore Lighthouse had provided a kind of peace; a sense of a day well spent; and yet we were only a quarter of the way around the island of Tiree. And then the dark clouds behind us caught up with the broken blue sky in front and the deluge hit. With a hissing of dark, low clouds, the threatened storm began. The rain was so intense that we abandoned any thought of climbing the hill towards the north coast. Instead, we fled back to the only point of refuge we knew – our morning cafe at Balemartine – and ran from the front car park into its inviting interior. Henrietta had more sense than to be waiting for us, this time, and the staff of the Balemartine Cafe laughed in warm mirth as four wet cyclists abandoned their machines near the door and fled into the cafe’s warm interior. And the figure jumping up and down in the red rain-suit. it was Paul, of course – the other husband in the party. After another hour in the cafe we felt duty bound to try again, despite the rain. Halfway up the road to the north coast, we abandoned any attempt at further travel. We were strung out in a line on the saturated hill. The ladies were a few hundred metres ahead of me. As group leader, and the most experienced cyclist, I was keeping a watchful eye on Paul, fighting a red ghost in the driving rain and not having the heart to tell him that the ladies had written the day off and decided we all needed to get back to the airport where we would at least be warm and, eventually, dry again. It took us about thirty minutes to get back to Tiree Airport. We did, eventually dry off and get warm again. The plane, did get through. We did get back to Glasgow. None of the bad weather mattered, we had a wonderful day full of adventure. 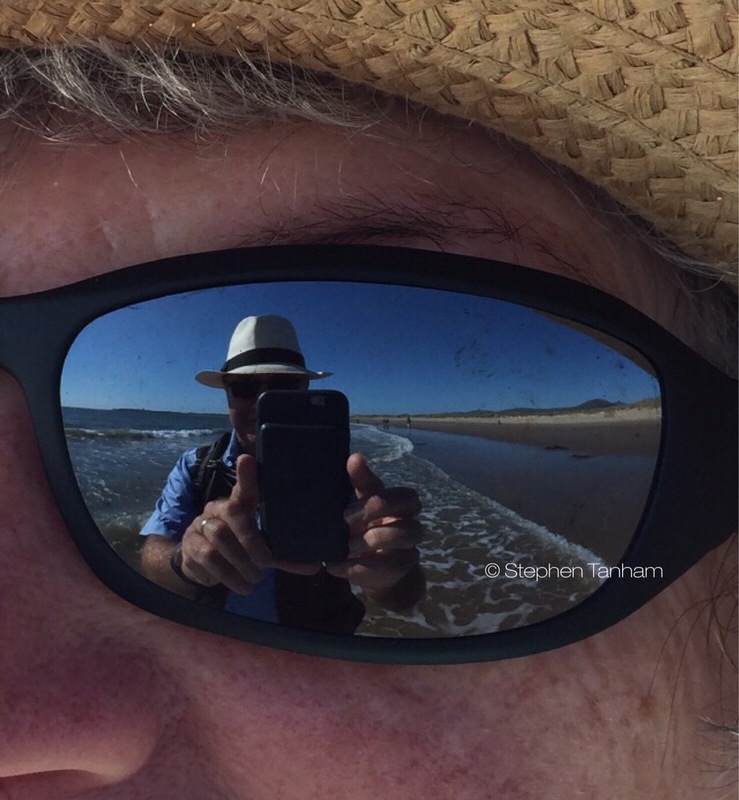 ©Copyright Stephen Tanham, text and pictures. Re-use with permission. Something had happened when we decided to approach the strange village by walking along the beach and coming to it via the old but grand harbour, with its mighty blocks and sea-gates. It was only later that we realised that what we had, inadvertently, photographed in the far distance was the focus of the whole story. You could relate it to one of my favourite Gurdjieffian pastimes: stopping the world. This technique requires a degree of stealth and an ability not to be embarrassed by the unusual – and your part in it! Stuart and I once caused such a moment of presence by each turning around from our table (shared with a very amused Sue) in a cafe and facing the opposite way (outwards). We were not trying to be irritating, just to do something unusual. The people we were sharing the cafe with took it in good part and assumed we were doing something humorous, possibly for a bet. On that day we had stopped after a few seconds; we had no desire to prolong it, simply to create the experience, good-naturedly, as an extension of the serious conversation we were having. What I didn&apos;t know was that the name Stevenson was that of a family of gifted and determined eighteenth century Scottish engineers, and that the uncle of Robert Louis Stevenson the author was a man named Alan Stevenson, and that what he and his father – Robert Stevenson – accomplished was the reason for the strange village of other-worldly buildings on this remote corner of the Scottish island of Tiree. The view from the harbour was of a set of what looked like cottages, with a tower to their left. 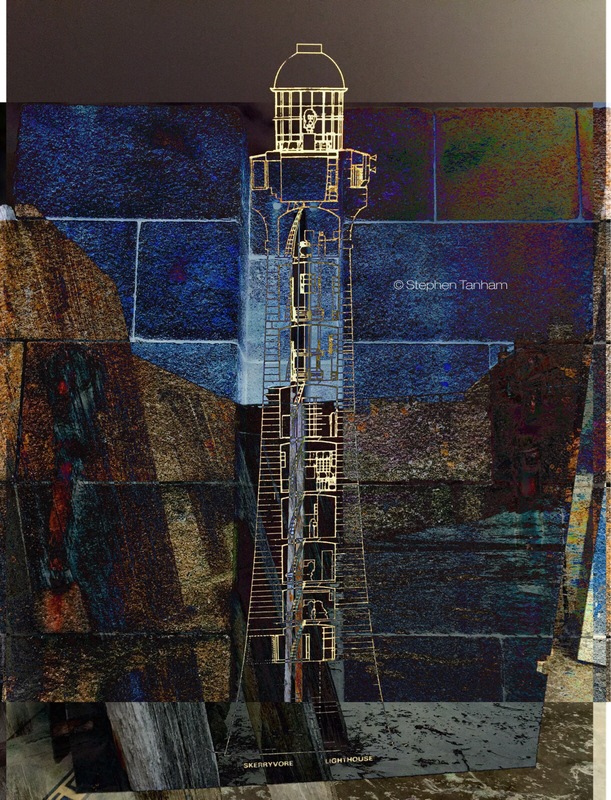 The tower was related to that view out to sea; the cottages were the modern home of the Skerryvore Lighthouse Museum, which had been established by the Hebridean Trust and lovingly restored and re-established over the past ten years to protect a vital piece of Scotland&apos;s history. To understand the importance of Hynish and Tiree to Scotland&apos;s past you need to understand the way Glasgow developed in the 18th century. From a purely personal perspective, Glasgow has always been my favourite city, north of the border, because I have family there and it was the scene of many happy holidays in my teens – one of them involving my first long motorbike ride (in the pouring rain!). To find, all those years later, that Glasgow&apos;s early success as an international city had justified what happened at Hynish was a thrilling discovery. Following the Act of Union in 1707, Scotland was free to trade, on equal terms with England, with the New World. Lucrative cargos of rice, tobacco, cotton, sugar and rum could now be imported to the Union via the deep estuary of the River Clyde. James Watt&apos;s 1760s invention of the steam engine also made Glasgow the most important exporter of manufactured good to the colonies. However, Between 1790 and 1844 more than thirty ships were known to have been wrecked in the area off the western edge of the inner Hebrides, as they fought the seas to enter and leave the Clyde. In 1814 an Act of Parliament was established to survey and fund the construction of an offshore lighthouse on the obstructing and deadly skerry. The Skerryvore rocks, located just off the bottom left edge of the map, above, were ten miles west of Hynish and the father and son team appointed to survey, design and build this enormous undertaking was Robert and Alan Stevenson. Work began on the construction of the lighthouse in 1738. 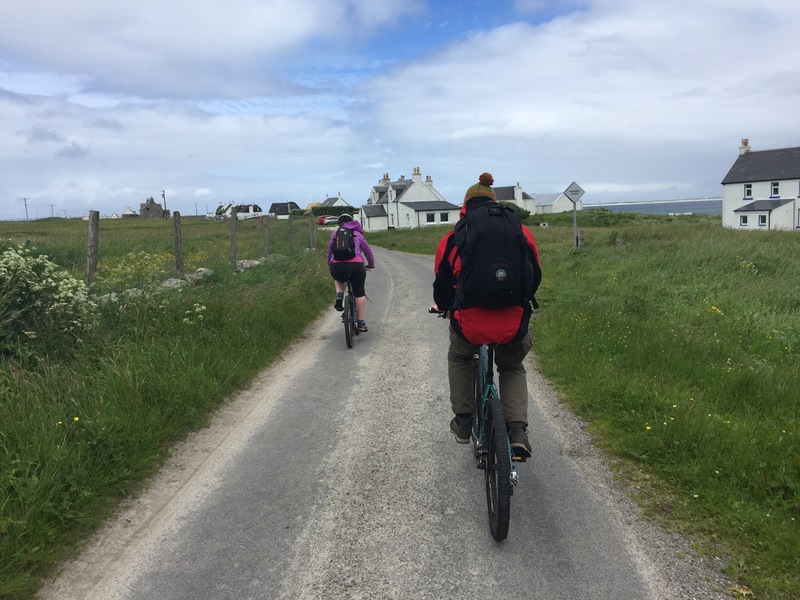 Our cycle ride had stumbled on the Shore Station that was built to support the construction of the Skerryvore Lighthouse – ten miles offshore. Later, a more makeshift station on the Skerryvore rocks, themselves, was constructed. As an indication of the severity of the weather, the latter, comprising a three storey structure for supplies, managers and thirty workers, was completely destroyed by a storm in November 1838. It was redesigned and built again in time for the following spring – the workers having agreed to stay and work on the rock through the winter! The most complex part of the lighthouse was its clockwork revolving light, which, incredibly, amplified the wicks of only four oil &apos;lamps&apos; and projected them across the deadly darkness. The key to this optical power was the use of the latest Fresnel multi-part lenses, which Alan Stevenson commissioned from the French Fresnel brothers in 1840. The eight lenses were (and are) only the size of dinner plates, but could project a bright beam over thirty miles! The lighthouse went operational in 1844 and the Shore Station was converted for use as living quarters for the shift of lighthouse keepers and their families. Today the lighthouse is automatic, and it is controlled remotely from Edinburgh. The entire structure of Stevenson&apos;s design has remained in near-continuous operation since its commissioning. Despite the weather, our day had brightened. We wondered if we dared hope for a continuation of our good fortune? I was very moved by our visit to Skerryvore and wrote a poem for my personal blog Sun in Gemini. It is reproduced, here. ‘Surreal’ is an often used word and does its best to convey a moment, usually quite fleeting, in which there is both a heightened sense of ‘being there’ and another feeling of strangeness. The two come together and we feel vaguely uncomfortable that something for which we have no real words envelopes us. 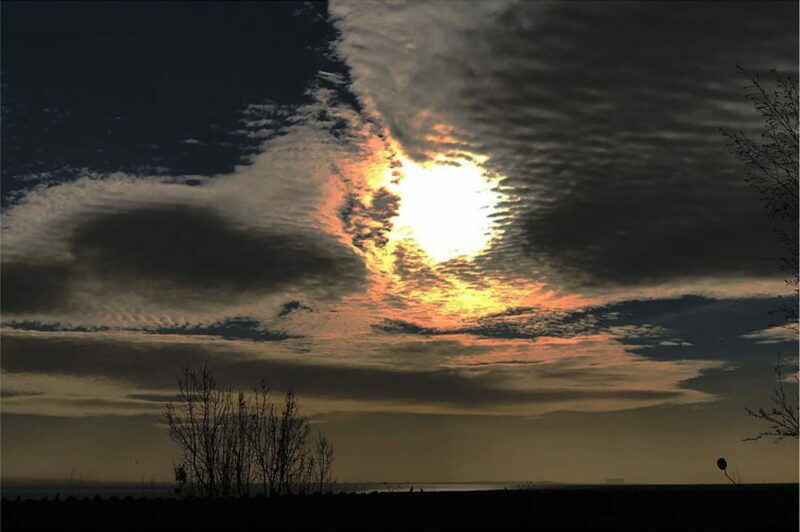 This state of consciousness is described in more detail in the Silent Eye’s consciousness course as being a temporary cessation of the ‘filters’ that cloud our experience of the seemingly ordinary world. A better word for the experience is ‘present’, as in present to what’s real. The impending storm had quickened our minds, in the way that survival does, and, with the first of the rain driving at the windows, we found we had entered an establishment that had just opened. The staff – four quite young people – looked at us as though we had camped outside overnight, falling through the door, in desperation, the minute they unlocked it. I suppose we looked a bit alien in our bright cycling gear. For a short while, we had the place to ourselves. The interior was plain but functional, as though it were half a farmhouse, which I suspect it was. The staff had the air of close family and riends, with at least three daughters on duty. Life on Tiree revolves around tourism and farming, with everyone helping out for both. Everyone we met on the island was very friendly, though you could detect a certain island manner. 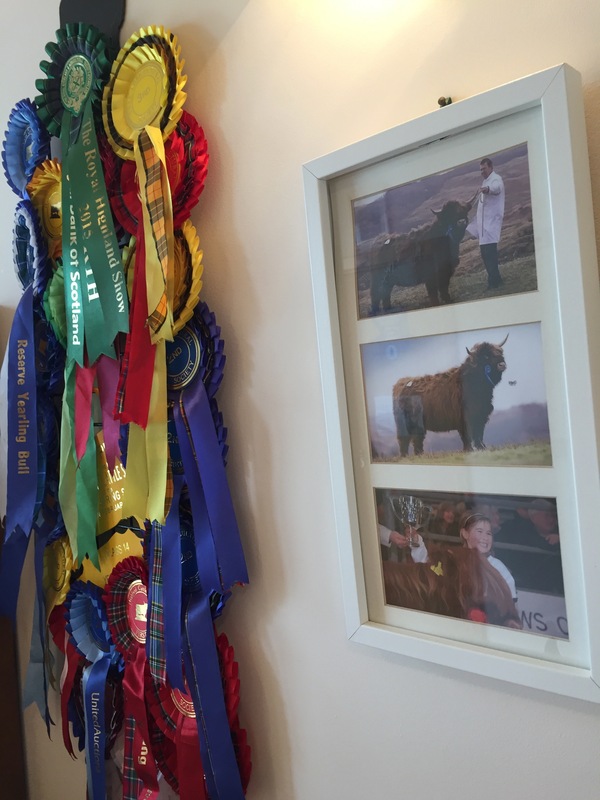 The cafe owners had a proud display of rosettes for their competition cattle. We were about to ask when a group of eight or so people arrived for an early lunch, closely followed by another, even larger group! 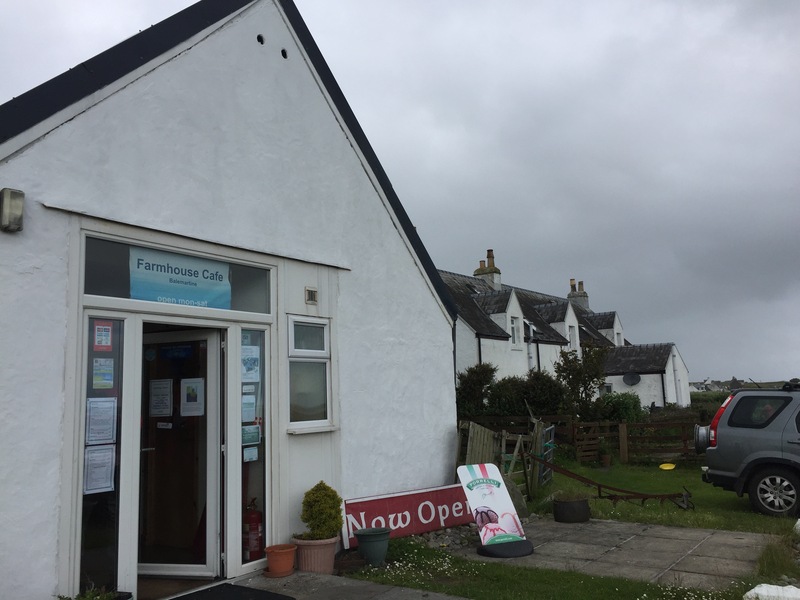 It was Saturday and restaurants are scarce on Tiree. We could see why all the family were employed, as the place went from empty to full in about five minutes. The downpour continued and we were forced to add some cake and a second pot of coffee to the mix before we stepped out into a dripping Balemartine. The saddles were sodden but a few minutes of emergency finger-wiping restored them to a usable condition. Ominously, the sky had not brightened, and we wondered if we were wise to leave the relative safety of the cafe. That sense of leaving ‘for an uncertain destination’ has always seemed to be at the heart of mysticism, too. The familiar is safe, but the dark skies of the unknown landscape can just as easily brighten to the beauty of the beyond, when the possible storm is observed to be a shallow and passing thing. The ‘inner quietness’ of such a spiritual moment was mirrored in our journey as we crested the next hill. Before us was a line of beautiful beaches, but that wasn’t what took our eye. Beyond the beaches was what looked like an old military base. We had only a basic map and no idea what the landscape offered, though we knew the island was relatively flat. The little map of the road showed we were travelling into a dead-end, so all we had to do was keep pedalling and we’d get there. Wild flowers, some of them quite exotic, were abundant by the sea. On the little meadow in front of this beach we even found a few wild orchids. And then the road came to a fork, with the dark cluster of buildings ahead. We decided to approach by the seaward track, leaving the bikes parked by a wall. We had been told there was no crime on Tiree, so we could leave them as we liked – even without Henrietta to guard. Wonderful things happen when you choose an unusual path to an envisioned goal. In this case the approach we made for ourselves, along the edge of the sea, brought us to a most dramatic vista. It was obviously a harbour, with the ability to seal off the flow of the tide so that some kind of vessel could be maintained. The sea was calm on our day, but we could envisage how violent it might be in the depths of winter. But what had been its purpose? The ‘dark village’, apparently constructed of the same stone, and at the same time, as the dock, seemed quite deserted, yet was, or had been, very important in Tiree’s past. What was this ‘ghost town’ on our tiny island? We climbed up onto its walls to get a glimpse of the whole complex of buildings from this perspective. 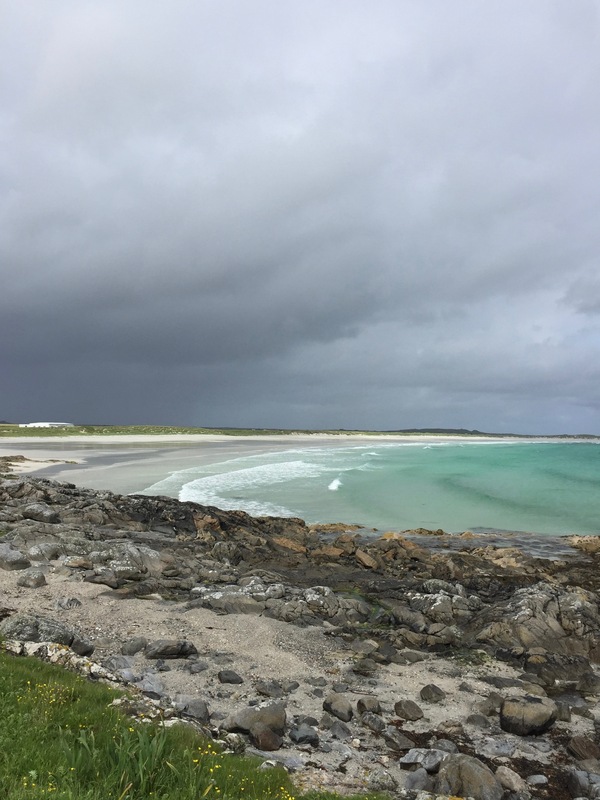 The answer would teach us as much about the city from which our flight had begun, only three hours prior, as the island of Tiree, itself… Despite the ever-threatening weather, it was becoming a very magical day. Because we had entered from the sea, we still had no idea what the dark village was, nor why it had ever justified such a grand and robust harbour. The answer was a lesson in Scotland’s history and a revelation of something quite astonishing in its scale and importance. It was also a lesson in how we take for granted the ‘giants’ on whose shoulders we ‘stand’ as Newton said. The Royal Mail man fixes the engine prior to takeoff… probably. There was, though, little distance to wave us through. Tiree is one of a pair of Scottish islands in this westernmost part of the Inner Hebrides – the other being Coll. Tiree is just twelve miles long and three across, and is relatively flat. It is renowned for its simple life, friendly people and beautiful beaches. The main building of the airport comprises just three rooms: an arrivals/departures main space which doubles as the baggage arrival hall; an office for the staff and a departures lounge. Outside, a man in a transit van waited for our small party with four hybrid mountain bikes – part of the package trip and a great way (we hoped) to see the island in a day. Our plane – an HS Twin Otter, sat on the tarmac outside the terminal, ready to take the six or so passengers who were now walking across the apron to climb its pull-down steps. An hour later, in the mirror of our inbound flight, they would be in Glasgow, having covered a distance that, on previous Scottish holidays, had taken us about ten hours by road and ferry. The whole day-trip was a combined Christmas/birthday present from two long-standing friends who have drawn up their ‘bucket-list’, and asked us to share this part of it with them. We were delighted to be there. The four of us are happy with the idea of such an adventure, though the other couple have explored far-flung parts of the world with a fearlessness what we do not possess. When you write blogs regularly you need inspiration. One of the most productive and creative methods I know to be inspired is to take a current theme to a new landscape and see what comes from the place. The trip to Tiree seemed ideal for this. On the flight, as the green highlands, lakes and seaways drifted by far below, I emptied my mind to allow the ingress of the most ‘topical’ comments made, recently, by our Companions – those who take the three-year journey of spiritual self-discovery with us via our mentored correspondence course. The answer that arose in my consciousness was an unlikely one: the topics of intrinsic perfection in the ‘world’ we experience and the idea within this of right action. 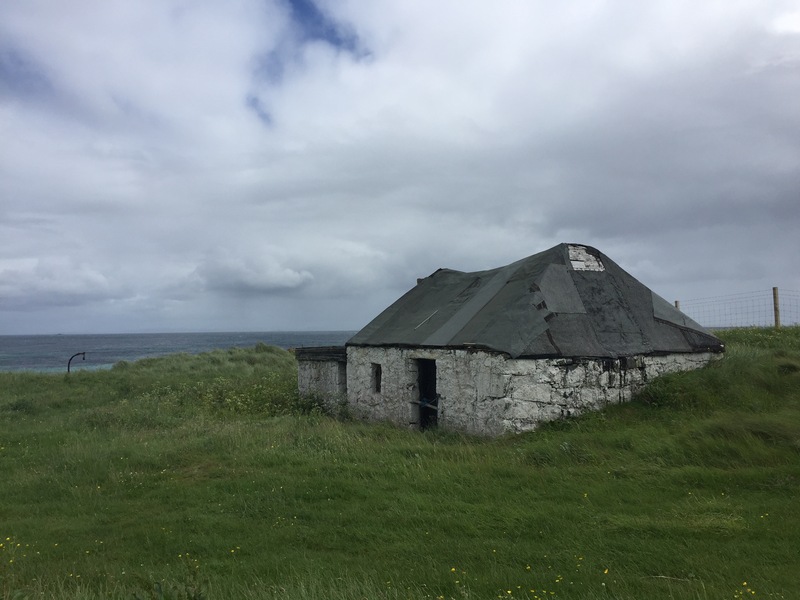 It was unlikely because the simple landscape of Tiree was likely to be just that – simple and lacking in sophistication, though that was not expected to detract from its appeal. The idea of perfection, in this context, is that the world is not as we initially see it, but ‘clouded over’ by lenses of the personality. Only by self-knowledge of how our daily ‘self’ has ‘hardened’ around a set of foundational reactions to life can we approach the cleaning of these lenses. When we do, we begin to see powerful changes in our lives – in fact, the world seems to change, whereas what is really happening is that we are seeing the truth for (possibly) the first time since early childhood – but with the gift of adult discrimination. The idea can produce a lively debate, as you can imagine, so it is generally reserved for the third year of our three-year guided journey, where it forms one of nine ways of considering ‘objective reality’ – that which simply is – beyond personal opinion. Leaving Tiree’s tiny but wonderful airport, we collected the bikes, turned left towards the island’s circular coastal road and, within five minutes, found ourselves at the main junction and beside a lovely beach. As the photo of Bernie (above) shows, the weather was worsening, with a stiff breeze coming off the sea. With some trepidation, we began to pedal away from the relative familiarity of the airport’s grounds and into the darkening unknown. The small plane that had brought us to Tiree did not have provision for refreshments – the co-pilot came out of the cabin and read out the safety notice before we took off, then returned to help the captain fly the plane! 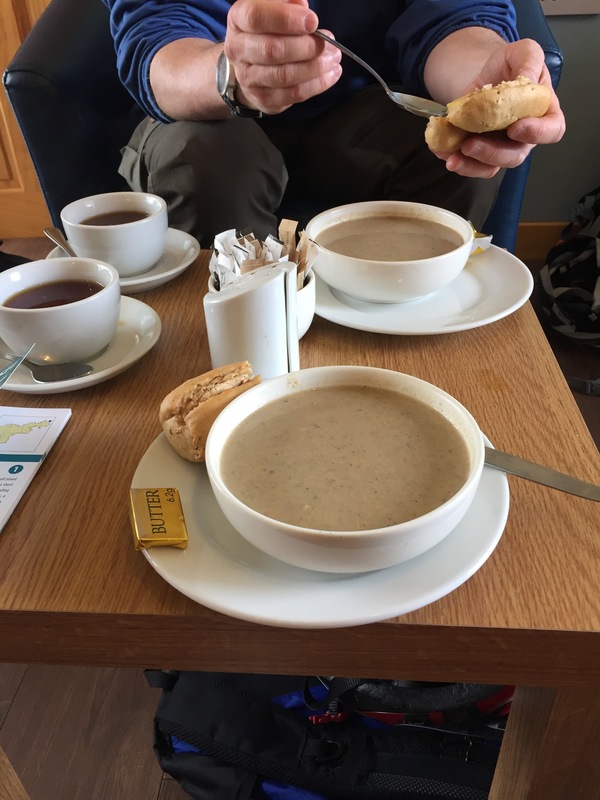 By the time we encountered the beach road, we had all decided that an early cup of coffee with a comprehensive look at the map would be very welcome – as well as giving us a potential place of shelter in the event of a downpour. Our opening few miles were quite difficult. The wind off the sea was brisk, to say the least. This was in stark contrast to the weather we had left in Cumbria, which, for once, had been warm and sunny! One of our group hadn’t ridden a bike for many years and needed a settling-in period, which was duly provided. They quickly recovered cycling skills that few really forget and, despite the constant stream of cars from the ferry port – indicating the arrival of the other form of transport to the island – we made our way, with increasing smiles, to the tiny village of Balemartine, where the map said, there was one of the island’s cafes. We had initially missed the cafe. Only the signpost alerted us to our error and we doubled back to find it just opening, which was just as well as the heavens opened and we fell into its welcoming and well-staffed embrace. I was last in, as I wanted to check the bikes were not intruding on the parking space. And then Henrietta, was we came to know her, joined us to guard the cycles. She stayed nearby for the whole time we were in there. 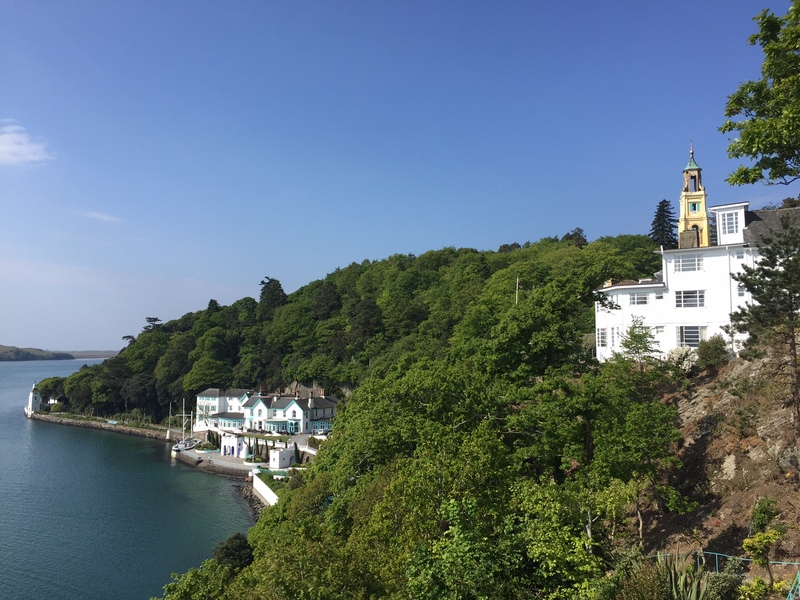 Our visit to the actual village of Portmeirion ended quietly, but with an interesting mosaic of happenings. We rejoined our colleagues, silent in our own conclusions – for everyone must find their own in a place like this, and there can be no right or wrong, for the author, McGoohan, is long departed. 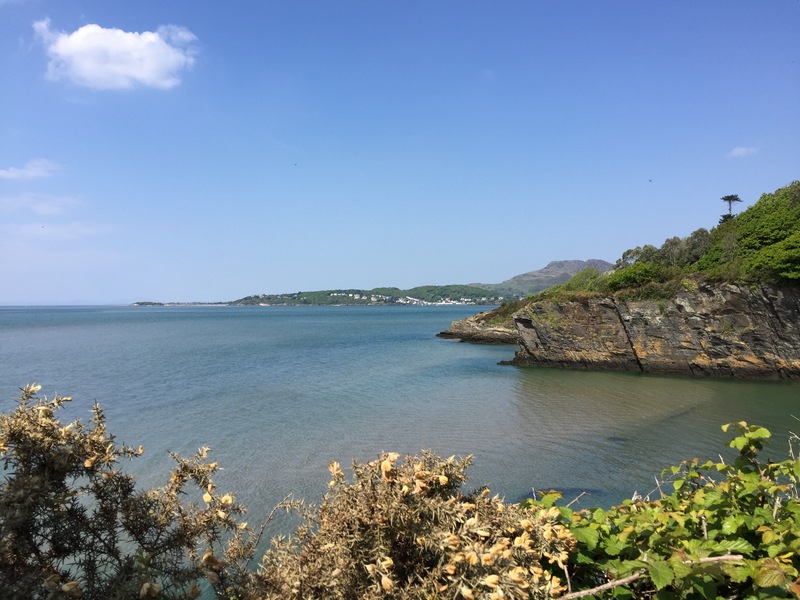 We took the beautiful coastal walk which would bring us to the place of the final set of Portmeirion readings, high up in the forest once more. There is only so far you can take a walking mediation like this. After a while, you need to step back and let the ‘now-ness’ of the actual place take over. This part of Wales, just south of Snowdon, is spectacularly beautiful, and days as fine as this was are rare in a British summer. It was important to move on and, in doing so, to bring our wonderful adventure in the ‘Village’ to a close. The Truth can only be in the now. Each of us discovers this in their own way. Even the wisest of books can only point us to that eternal basis of the ‘real’. We live in an organic body; a body which is undergoing cycles around the sun that will eventually lead to its death. Death is programmed into the genes of the human being. It could have been otherwise but it is not. We, therefore, have to look within our lives – that sequence of the moments of now – for that which is eternal, for we will not find it in our bodies. We might say that in an act of fully experiencing the now we bring together two worlds. What those worlds are and their significance in our lives is a matter of personal discovery. The past weighs on us in the form of our beliefs, fears, memories, likes and dislikes. This accumulation becomes something that we have no choice but to assume is ‘us’. But that is false. What is us lies ‘beneath’ that layer of detritus, and it is the job of mystical schools to tease it out and have it take its rightful place. The inner part of our being – the soul if you like -will use ‘the accumulation’ as cleverly as possible to fashion an effective instrument of consciousness and action in the world it must inhabit. But it is only by realising that we are really kin to the inner and not the outer that freedom can be truly viewed. A fuller perspective would show how the nature of our experience is closely tied to what we need the most in order to, finally, see the real. 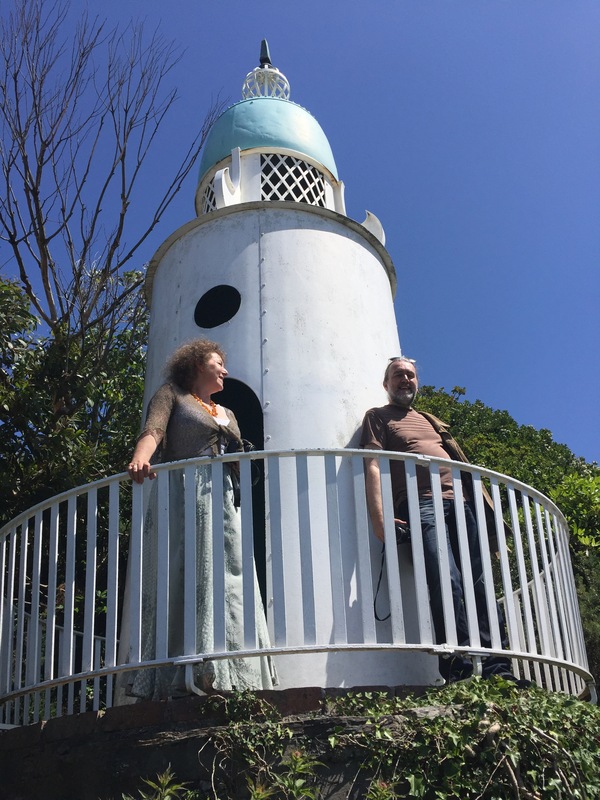 This one was prompted by Sue announcing that she could live in the small lighthouse, built by Clough Williams-Ellis, as one of his jocular landscape features and on the basis that the new Portmeirion village didn’t have one. It was obviously conceived as a piece of humour – it looks like it was rescued from a ‘Clangers’ set – the 1970s children’s TV show. True to form, Stuart climbed up, as well, and they set about deciding what renovations would be needed before it was habitable. Much mirth below. Proceedings halted for while, until we could move on, again. I have another photo of the two of them up a tree – the next item in our mosaic – but we have an agreement, usually honoured, that we will not publish photos without the subject’s approval. 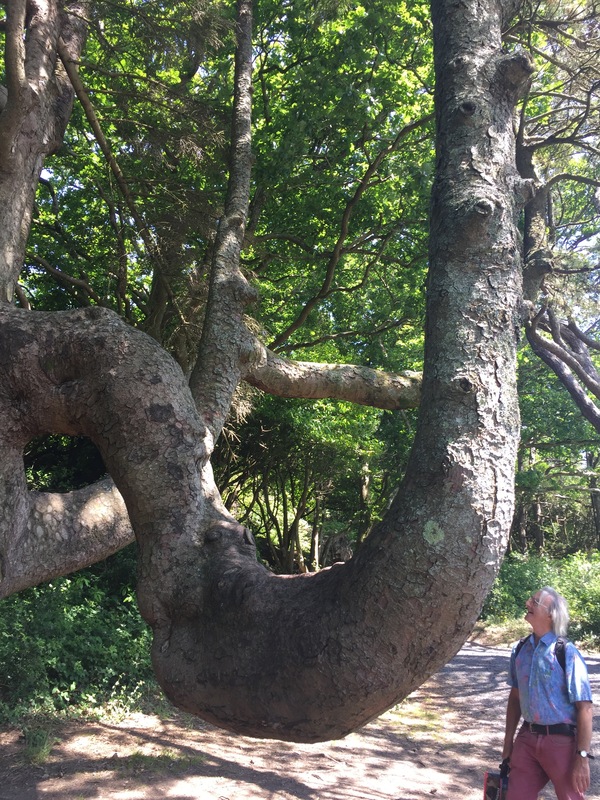 Instead, here’s a photo of the tree with John about to size up the possibility of sitting on its bent and horizontal trunk. For the second day in a row, our chess champion was about to contribute some mystically-themed reading, many of which he recited from memory. Stuart and Sue contributed a great deal to the weekend with their ‘bibliomancy readings’. At each place, someone from the group would be asked to open the selected book at a page of their choosing. Then, another person would pick one of the readings from that spread of pages. The reading would then be made. It is a matter of record how much such a method of selecting, using an appropriate book, can throw light on the topics of the day. The reader is referred to Stuart’s blog where the whole sequence of his and Sue’s trip is narrated, in order of how the bibliomancy reading were selected and given. Soon, though, it was time to leave this beautiful cove, and to take advantage of the perfect weather to visit another – though one in a very different landscape and from a very distant period in time. The spirit of levity still dominated the day. 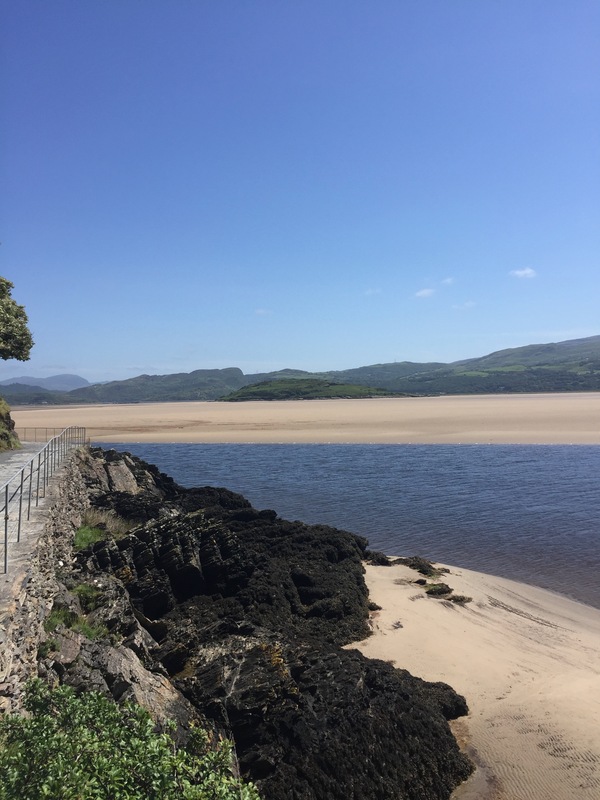 We said our goodbyes to Portmeirion, knowing we had established a strong enough connection to draw us back for further visits. Just around the estuary, a very much older landscape beckoned, one that was to fit very well as our theme moved from ‘acceptance or resistance‘ to ‘authority‘. 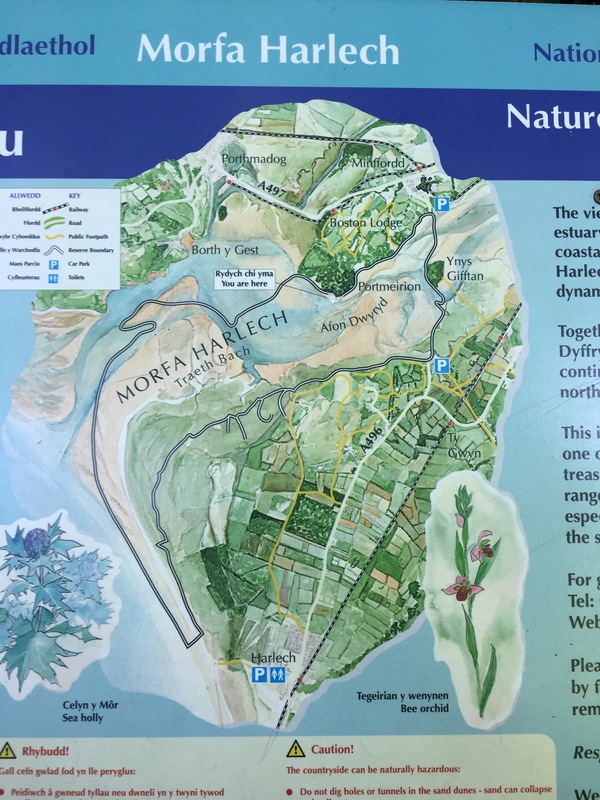 Thirty minutes by car away and seven centuries in time, the Men of Harlech were waiting… The prisoner might have established his attitude to Portmeirion, but the iron first of the establishment was about to respond in stone. 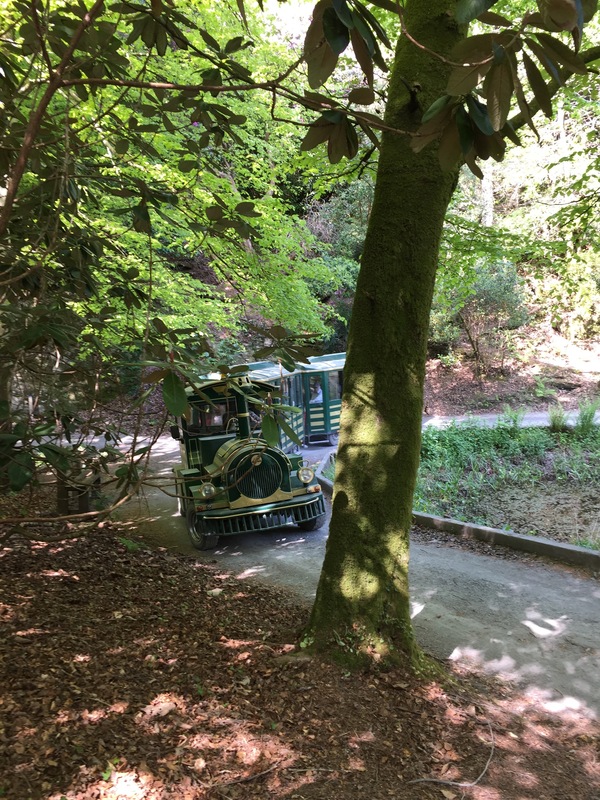 As the land-train pulls out of the main square in Portmeirion, we head up into the forest. 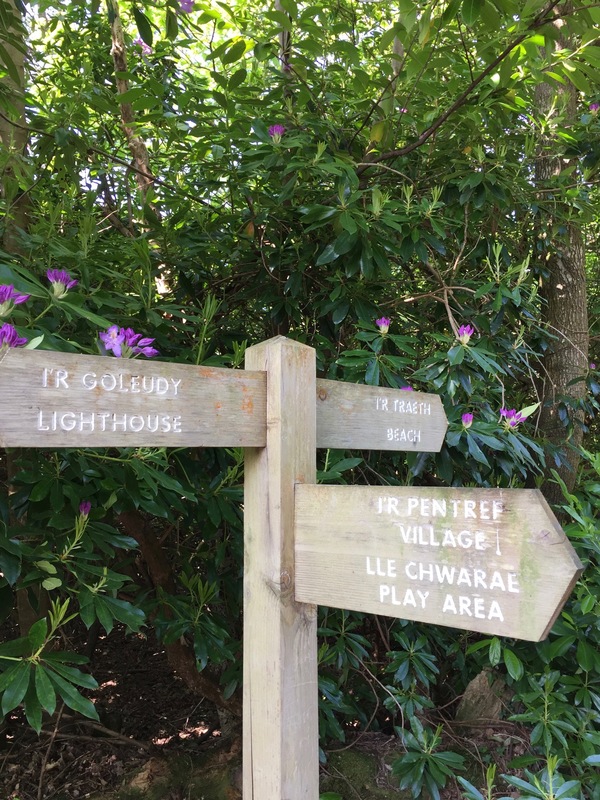 There are three distinct internal regions within the Portmeirion site. The first is the village, itself; the second is the coastal walk; and the third is the forest walk. The little train follows the forest road, but stops to give a view of the coast in several places. 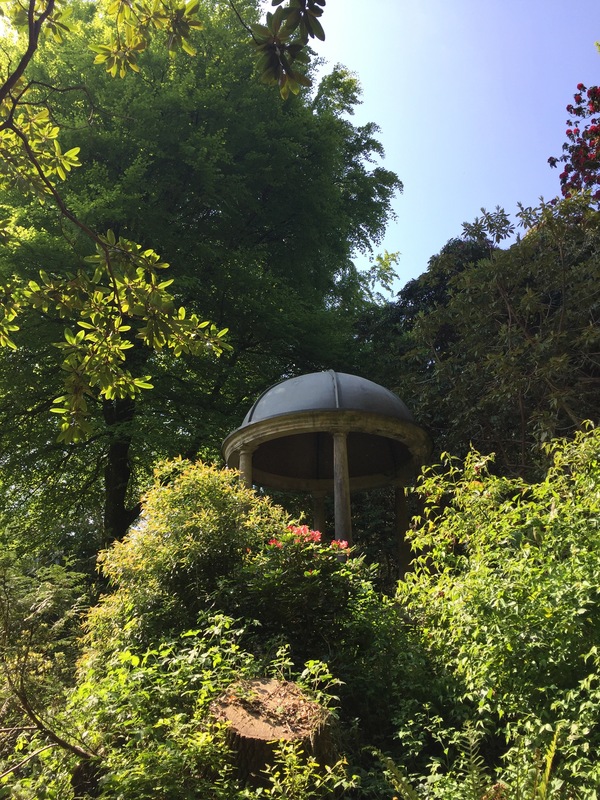 Sometimes, it’s difficult to separate the often wicked humour of the creator of Portmeirion – Clough Williams-Ellis, from the mental overlay that hunters of the ‘Prisoner experience’ project onto this unique place. 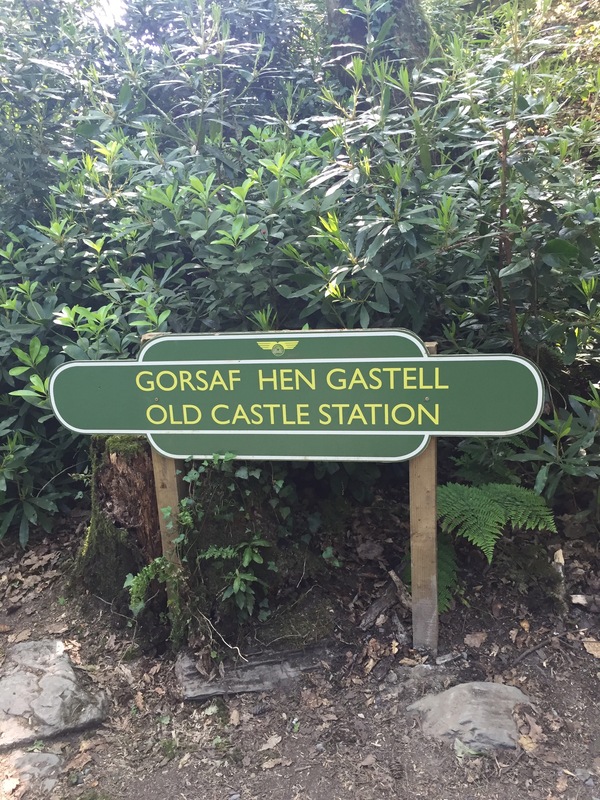 Station names like: Salutation, Old Castle, Playground, and Shelter Valley all take on a secondary, if not intended meaning within the context of following the McGoohan mind as you attempt to tease out the secrets of this landscape embedded in the Prisoner series. We had invited our companions to spend their own time in the forest before meeting up for a group walk along the coastal path. The forest is a very special place and, to my recollection, featured in the Prisoner series only when No 6 was running away or having secret meetings with other ‘prisoners’ – many of whom were planted, and simply pretending to suffer to get No 6’s sympathy so that he would tell them why he resigned. The thought brings back the central question of the series: why was it so important that the various No 2 characters found out the motives of No 6? They were presumed to be all-powerful, so why did it matter what reasons had engendered the resignation in the first place? 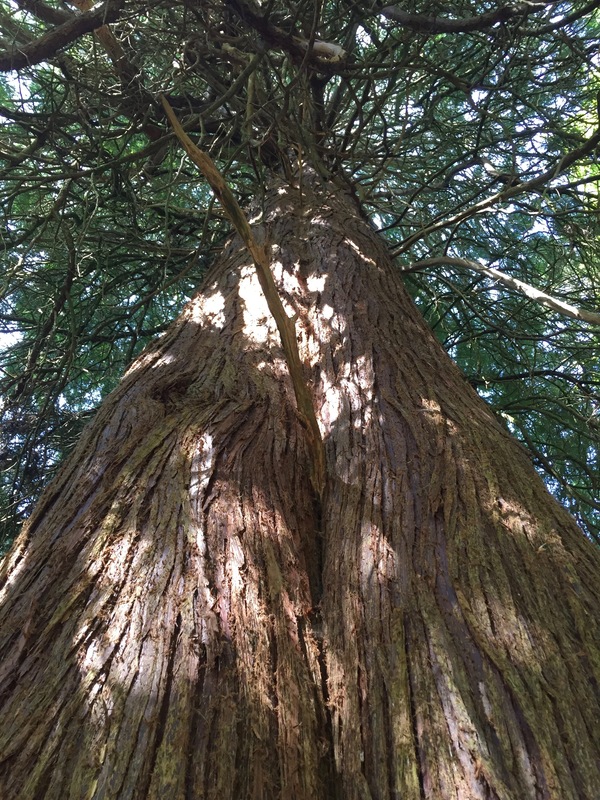 “His power – the very reason for him being here and retaining a glimmer of that power – was that he had a secret,” hisses the intense green all around us… The sun is getting hotter and the deep, summer blue fills the gaps in the canopy of the forest. The shifting has begun, again…. 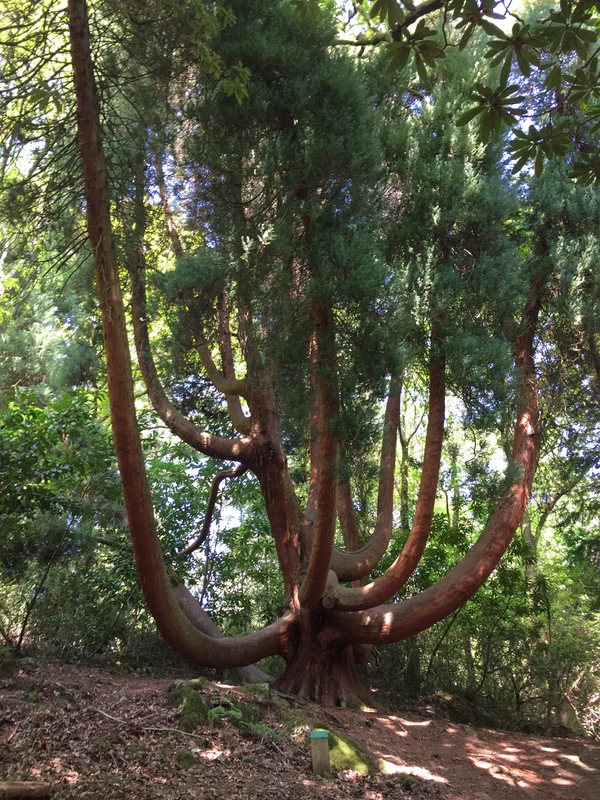 We are climbing now, and, up ahead a Japanese Cedar curls out its exotic curves, projecting an image of something that goes somewhere via a very roundabout route. Its shape suggests that straight lines don’t necessarily get you there as you expected, and sometimes curved paths are more fruitful. 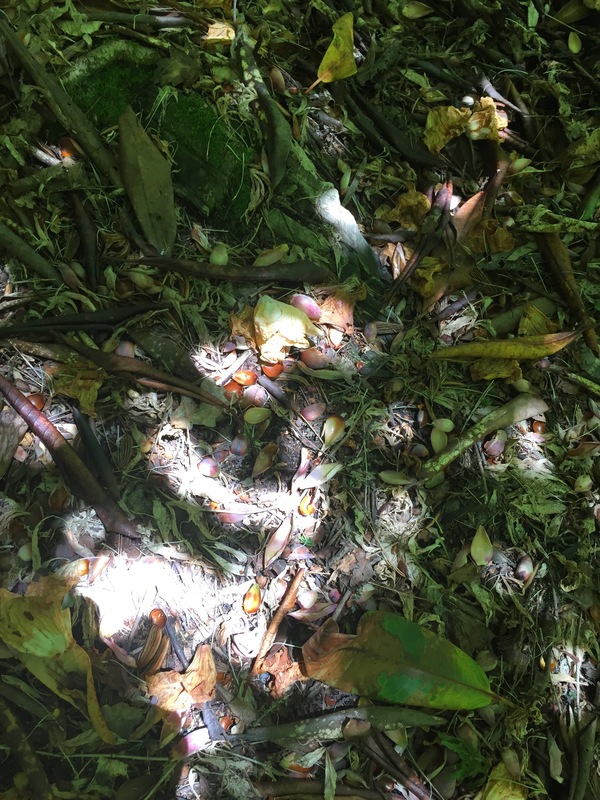 The forest begins to speak for itself; there is the sense that we have discovered enough, that if we take what we have and see it from the green wholeness that this place provides, the important patterns will emerge. We say little, simply walking and letting our thoughts wander. “I’m going to take a stab at it,” I say to Barbara. “What, the whole thing?” she laughs. “What’s to lose?” I ask, sounding more sure than I am. “Ok,” she says, challengingly; waiting and watching as I draw breath and look out to sea. Another breath, deeper this time, because I’m assembling this, charged with the forest’s green energy, as I go. “No One, Oneself… Take your pick. The other ‘controllers’ are the regents of the ego, trying different ways to undo him – as they have done all his life. They don’t answer his question of Who is No 1?, because they can’t.” I pause, slightly giddy with the ride, and grinning like the proverbial cat. Underlying outline from the Hynish museum of the Skerryvore Lighthouse.